How to SELL and MAKE money! ...and fourteen days later, your check is ready! Truckee Meadows families that sell with us earn an average of $330 at each sale and so can YOU! Register to be a Consignor today and print the GETTING STARTED GUIDE here. Consignors shop our presales at 12:00pm on Friday, April 12th. Join other smart & savvy helpers who cover shifts in exchange for early shopping privileges. We LOVE our JBF Team! Shop EARLY at Saturday’s Half Price Party with a guest at 5:00pm. volunteers shop EARLY with a guest at 5:00pm. Our Volunteers are allowed ONE guest during presale shopping times. Join us at our Volunteer Appreciation Potluck in October, too! ALL volunteers MUST fill out a Volunteer Waiver and check in and out for EACH shift. Sign in sheet has timecard on reverse side. You may drop off your items at any time. However, If you have over 300 items please email me for an appointment. If you have 500 or more items, you must volunteer to help sort on Sunday. (This is mandatory, it will help all of us get done on time for pick up). Bring your items tagged, prepped (see info below), and sorted by type & size. Bring your signed Consignor Agreement, Car Seat Checklist, and Crib Waiver (if applicable). A friendly JBF Volunteer will greet you and give you further instructions. You will bring your items into the inspection area where everything will be opened, inspected and tested, so please plan to allow up to two (2) hours for this process depending on how many items you are selling and how many consignors in front of you. Drop off will close promptly at the posted times. All items that have not been picked up are donated at 8:01pm sharp. You get to choose whether or not your items are donated when you create your tags. Those items that are marked for donate, and are not picked up, are given to Casa de Vida. (See our "Giving Back" tab for more information on Casa de Vida). ALL items not picked up by 8:00pm, will be donated, no exceptions. Please make sure you are on time. You will need your ID and to fill out a Consignor Pickup form when you arrive. If you need someone else to pick up your items for you, you must inform us of who will be picking up your items. Please email vickidame@jbfsale.com with the name of that person. They will need to bring their ID. Please hold all questions regarding items that may or may not have sold until AFTER you receive your check. Some items are manually entered and will NOT show up on your report. The two weeks after the sale is when we do our audit and items that may not have previously shown up, may after this time. How do you get your money? We will be sending your consignor check via email, this way you will receive it faster. Please make sure that the email address on your profile at the time of drop off is your correct email. This is the one we use to send your check. The process is simple, we email your check, you click on the enclosed link and print your check. That's it! SCHEDULE your shift to earn more! Diaper bags, infant carriers, backpacks, and purses are great consignment items. Please inspect all items carefully to make sure items have not been recalled, stained, damaged or are missing pieces. Stained or damaged items that get past the inspection process affect our reputation and yours, please bring only your best. Bedding sizes accepted are bassinet through twin only. Please be selective when selling bedding, blankets, receiving blankets, burp cloths, and towels. New and barely used items sell best. Check carefully for stains; shoppers get very disappointed if they find a stain in a bundled blanket once they get home. And that will affect our future events and your sales. Package: Bedding/crib/bedroom sets will be taken out and inspected, so please be prepared to put these items together in original packaging or in giant clear plastic ziploc bags. Arrange bedding sets inside bag so that shoppers can see all of the items as well as the design/pattern. Secure the bag, after inspection, so that items do not get separated. Bundle blankets and towels on adult sizer hangers, and cloths, etc. with ribbon or string like a package (be sure multiple pieces cannot be separated). Tag: If bedding is in a plastic bag, attach tag securely with packaging tape to the inside of the bag but please, do not tape the bag shut these will be inspected during drop off (bedding set prices vary widely and securing tags inside bags prevents tag switching). If bedding/blankets are bundled with string, attach tag directly to blanket and tuck it under the ribbon/string so that it does not easily get pulled off when shifting around during the sale. Package: Use clear, self-seal bags or clear cling wrap (saran wrap) to hold multiple items together; Tie sets of books together with ribbon/string. Be sure that parts/games to video game systems (such as Vtech) cannot be separated or switched out at the sale. Do not seal these items until after they are inspected. Price: Prices can range from $.50 to $50 in this category, depending on the item. Price to sell especially for books & DVDs as there are always lots to choose from at the sale. We DO NOT accept VHS tapes. Tag: When tagging books, please attach your tag to the book with blue tape that it can be removed without damaging the item. Tape tag to the outside cover of glossy books and to the inside cover of books that will easily tear when removing the tag. Please do not use masking or double sided tape. Hole-punch JBF tag and tie to sets. We sell children's clothing Preemie through size 20, as well as maternity sizes. Our Fall Sale is all season. Be picky. Look at your clothing items as if you were going to purchase them. No stained or damaged items will be accepted. Any items that look like "mom's" clothes will be rejected at inspection. Please freshly clean your clothing items. Replace missing buttons, sew loose hems and seams, and clip loose threads. Please button all buttons, snap all snaps, zip all zippers before you arrive at drop off. This will ensure that there are no defects in the clothing. The newer the item looks (and the better it smells), the better it will sell. Package & Hang: Hangers - Please hang clothes so the hanger hook points to the left (like a question mark). Hang size 0-6 clothing on child-size hangers and sizes 7-20 and maternity clothing on adult-size hangers. Clothing that falls off the hanger onto the floor does not sell well. Old Navy, Carter’s and many outlet stores are great places to get free hangers (they throw away hangers daily!) and Walmart & Target sell child-size plastic tube hangers at a great price. Clothing Sets - Sets tend to sell better (under size 6) so match things up if you can. All garments should be hung with the hanger hook pointing left (hanger should resemble a question mark when looking at the front of item). Safety pin or use a tagging gun to attach clothing sets securely with bottom garment hung on the backside of the shirt, so both pieces can be viewed without separating them. Pants/Shorts - Pant-clip hangers are great but if you use a standard hanger, simply use a safety pin to attach pants to the top part of the hanger so the garment will not slide. Onesies - should be hung on hangers as well, you can create sets with multiple Onesies by pinning them together through the seam in the shoulder (or using a multi garment hanger). Socks, tights, hats and infant mittens - need to be in a clear zip-lock bag (you may group multiple items in one bag). Please be sure to label your tag well so that customers know if the items are short-sleeve onesies or long-sleeve onesies. Price: Hanging Clothing - Put outfits/sets together to price for at least $3.00; Start at $3 for basic, generic brand 0-24mo outfit. Add $1 each for larger size, name brand, formal, and heavy/winter. Non-hanging Clothing - Put sets together to price for at least $3.00, but okay to price for less (i.e., 6 pair of socks for $1.50). Remember – price your items to sell! Overpricing items will only affect your sales and our reputation. Tag: Clothing on Hangers - Attach tag with a tagging gun or safety pin to the label of shirt or the underarm SEAM. Insert the gun in a label or inside seam NOT through part of the clothing (to avoid making a hole or tear in the clothing). Also, pull on the tag to make sure it is properly secured and will not come off easily. Please make sure consignor tags are pulled out of the clothing so they are easily visible to the customers. Non-Hanging Clothing - Please use tagging gun or safety pins to attach tags to socks, tights, infant mittens, and accessories. Be sure to also attach multiple pieces together. Then put these items into clear zip-lock bags. Please do not tape bags closed – they will be inspected then you can tape them closed). Make sure that shoes are clean, clean, clean! We will be VERY selective with shoes during Consignor Drop Off & Inspection. Shoes must be current season. Tag: Punch a hole in the top of your tag and attach the tag to the shoes with the ribbon, string, or zip tie. For infant shoes in a clear zip-lock bag, secure the tag inside the bag facing out and tape the bag shut with clear packing tape after inspection. Ride-on toys, block sets, dolls, remote control cars, outdoor toys, learning toys, and more. All toys must be checked for safety recalls (link) before consigning. Clean all toys and baby equipment thoroughly. Please test to make sure that toys and equipment are working properly. Battery operated toys must include working batteries (these can be purchased inexpensively at local discount stores). Package: Keeping tags and multiple items attached is essential for your items to sell. Bag all small parts belonging to toys/equipment in self-seal bags and tape the bag shut with clear packing tape AFTER inspection. Fasten the bag securely to the item with ribbon, tape, or zip ties. Items must include ALL working parts. Come to a FREE Tagging Party! We have them on the typically on the first Sunday of each month, and we supply everything but your items. There is even a place for your kids to hang out and play! You can find more info here. Mark all of your items Reduce AND Donate to qualify for Express Drop Off. Reserve your spot here, there is limited space. When you drop your items off on Wednesday or Thursday, check in as you normally would. Bring your items to the Express Drop off area. All items NOT accepted, will be donated to our charity. You're done! Super easy, right? Why should you Reduce AND Donate all your items? Check out this video. Perfect Consignors - We can't thank you enough! We appreciate those consignors who spend the extra time at home ensuring that their items are stain free and tagged correctly and want to reward them for their hard work! If you have less than five stained, damaged, or unacceptable items pulled at drop off or during the sale (and zero recalled items), you will be added to a list which allows you to skip inspection during drop off at the next event. This saves you lots of time at Drop Off! We do ask that you put your own items away. REMEMBER: Perfect Consignor status is earned each event. Spend extra time inspecting items at home so that you earn perfect status for the next event! Perfect Consignors for Spring 2018 Event (these consignors don't need to go through inspection). I wish Just Between Friends was around when my kids were little, but I've got grandchildren now. I get it! Raising kids is expensive. JBF Reno wants to help! My daughters and son needed a ton of stuff from the day they were born until...well it never ends. That's why I love this business. 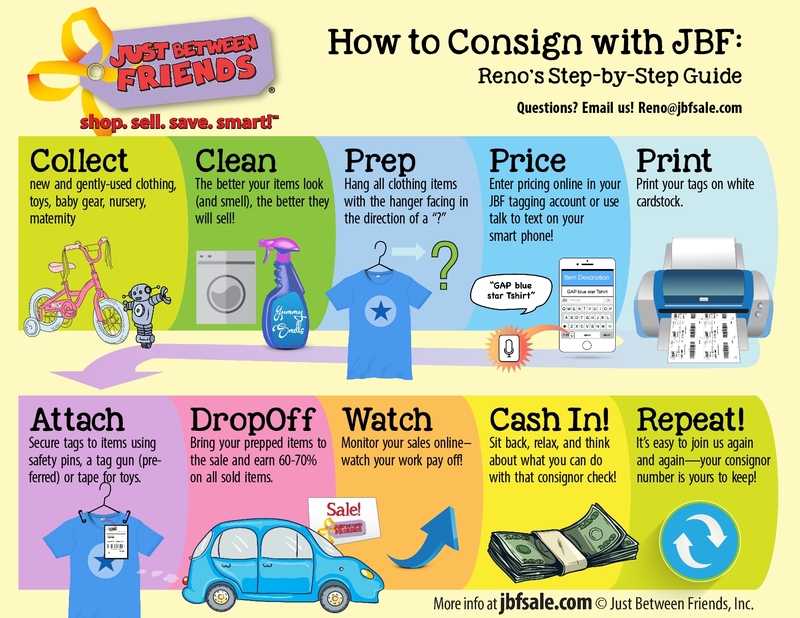 I know JBF helps families save so much money and they can earn money on their gently used items. Plus, it fits right in with reducing, reusing and recycling. It's a win-win!